"Released in the fall of 2006, this was our first seasonal ale. However, the incredible response prompted us to make it available all year long on draught and in 473 ml cans. Brewed with 6 select malts and 4 premium hops, it has a rich mahogany colour, reminiscent of early English pale ales. The wonderful hoppy aroma is revealed even before your first sip, followed by a hearty malty body, and culminating with a pronounced bitterness. 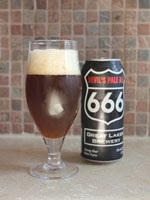 Prepare yourself for a devilishly good time…"
Poured from a can, this beer has a gorgeous dark orange/rust colour. Lots of carbonation, with three fingers of off white head. Some hop haze to it. Wonderful hoppy citrus, fruity notes. Some fresh cut grass and lemon peel notes. There is a hint of maltiness, raisin and slight breadiness. The hops are definitely the predominant aromatic note. Unlike the nose, the maltiness hits the front of the tounge and washes over the rest of the mouth. There is a nice bitterness to the finish that could be expected from a British styles Pale Ale. Slight metallic taste but not over powering. Very smooth mouth feel. A very solid Pale Ale. It is interesting how the hops dominate the nose, but the maltiness dominates the taste, culminating with a nice bitter hoppiness in the end. This is a solid B, borderline B+ of a beer. Definitely something to enjoy again. Very true to style, this is the first beer I have tried from Great Lakes Brewery. I am definitely interested in sampling some of their other wares.